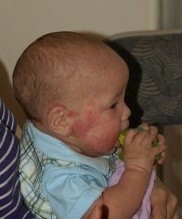 My Baby Has Eczema » Blog Archive » Multiple Allergies – What Does the Rest of the Family Do? Multiple Allergies – What Does the Rest of the Family Do? So one of your family members has been diagnosed with severe allergies to a bunch of foods. It’s not just gluten; it’s not just soy, or eggs, or nightshade, or dairy. It’s all of them. And more. Should you put the whole family on the limited diet or should you cook two separate meals three times a day? There isn’t really an exact answer to this question. The answer will vary with the family and circumstances. However, I think I could give you some advice based on my experience with first a brother and then a son with multiple allergies, as well as myself having gone gluten-free for our baby (which, by the way, seems to be doing quite well–his eczema has not progressed since I did that). What exactly you do with the rest of the family’s diet will almost certainly depend on the number of allergies and the severity of the allergies. For instance, if you have a child that has a life-threatening allergy to peanuts, then it would probably be a good idea to banish peanut butter and all peanut-containing products from the home. Almond butter will work just fine, even if it is a bit more expensive–but it’s way cheaper than a trip to the emergency room! However, if your child (or other family member) has a very large list, but no or few life-threatening allergies, it probably wouldn’t be a good idea to make your whole family adopt the special diet. Not only can it get very expensive (especially for a large family), but it would deprive the others of much enjoyment. You may need to get some extra kitchen equipment if the person has severe, life-threatening allergies to certain things. I already mentioned substituting almond butter for peanut butter. In my home, we have a son who is allergic to peanuts and all other nuts, but he is not highly sensitive to minute amounts of anything. He is actually allergic to most seeds as well as nuts, yet I can use my blender for making pesto for him after making nut milk for the rest of the family, and he has no problem. Of course I clean it first, but I know it isn’t as clean as new. So I haven’t banished peanut butter and other nuts. He just never gets any. This is nice for us, but many families will need to take into consideration getting separate equipment for items that cannot be perfectly cleaned (like blenders, bread machine pans, toasters, etc; pans and dishes and silverware shouldn’t be a problem if thoroughly cleaned). Does this mean you need to cook 6 meals a day? Not necessarily. It depends on the list. Suppose you have someone allergic to wheat, and the family wants sandwiches. Just use wheat- or gluten-free bread for that person. Allergic to potatoes? Put a sweet potato in a separate pan while baking potatoes for the rest of the family. Allergic to dairy? Cook some of the lasagna in a separate pan without the cheese (use tofu or quinoa or some other seasoned filler instead of ricotta and leave off the mozzarella). If there is a long list of allergies, you may need to serve 2 meals at a time, one for the allergic person and one for the rest of the family. That is the reality in our house. But that doesn’t mean I spend all my time in the kitchen. There are actually 3 diet plans in our house: The long list of prohibited foods for Manny, gluten-free for me, and anything goes for my husband and daughter. Usually that means I eat one diet or the other. Rarely I’ve been known to cook 3 different cereals (say, amaranth for Manny, oats for me, 5-grain cereal for the other two), but I usually only cook two things. Today we had grilled veggies & tofu. Manny couldn’t have them, so my husband fixed him something else. He and our daughter ate the veggies with bread, but I just left off the bread and ate the veggies and tofu. However, sometimes I cook things in bulk for Manny. Pancakes, waffles, biscuits, squash, beans, etc, can all be cooked in bulk and frozen. Then when I don’t have time to cook a regular meal, I can pull something out of the freezer. When we have beans, sometimes I take out some of the beans before we season them (he can’t have the tomato sauce we add to our beans) and season them separately for him. When I made millet pudding for the family, I made some with nut milk for us and a small batch with hemp milk for him–but I baked them at the same time. He can have many of the veggies that we have, so I make them available for him with whatever his main course is. We also have an allergy-free cold cereal available, and some crackers and rice cakes, so that when we are in a rush, there is something we can feed him for supper (at our house, lunch is like most people’s dinner, and supper is a light meal). When we have pasta, we cook rice pasta for him and put olive oil, yeast flakes, dry basil, granulated garlic, and salt on it, while the rest of the family has a sauce of some kind (cashew cheese, spaghetti sauce, pesto, etc). He can usually have some salad, if I leave the tomatoes and carrots out. So if the list is long, you may need to fix two separate meals, but often you can prepare two similar dishes at the same time. Making two lasagnas takes only a tiny bit more effort than making one–and no extra baking time if they are baked together. Having extra meals frozen and ready to eat can be very helpful, so when you cook, cook in bulk. 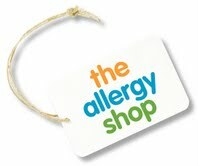 If the person only is allergic to one or two things, the severity of the allergy and the rest of the family’s love of the item(s) will make it easy to determine whether to cut it out of the family diet or not. But when the list is extensive, as in my son’s case, you may need to change your attitude toward cooking, spend a little time now and then in the kitchen, cook some things in bulk, etc. It is, however, totally doable. And the rewards–less itching, growing better, better attitude, etc–will definitely be worth the effort. This entry was posted on Sunday, September 23rd, 2012 at 6:55 pm	and is filed under Research. You can follow any responses to this entry through the RSS 2.0 feed. You can leave a response, or trackback from your own site.